Saturday, December 7th at 7 pm and Sunday, Dec. 8th at 2:30 pm are the big dates for this years performance by the Sage Valley Voices. 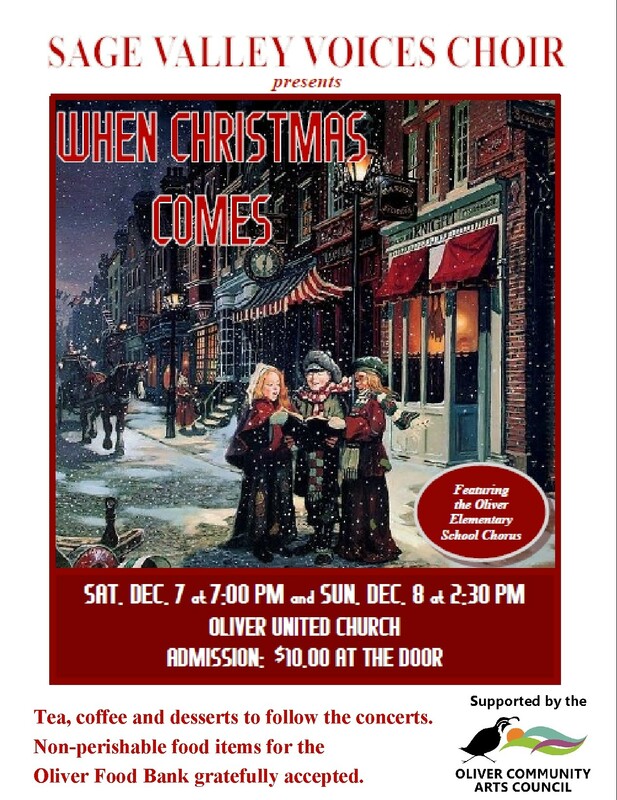 The concert, “When Christmas Comes” will be performed at the Oliver United Church. It is a wonderful way to share the Christmas spirit with the entire family. This year we have a new conductor, Lori Martine, and she is bringing along the Oliver Elementary School Chorus to add to the fun. Christmas isn’t Christmas without children! Lori works hand in hand with pianist, Sandy Andres. Both are enjoying the pleasure of a new keyboard that can create sounds like a pipe organ or a flute. The members of this choir sing because they love to sing and the atmosphere at rehearsals lifts the spirits. We start by learning to relax and Lori’s relaxation exercises would put anyone at ease. Before you know it, sedate adults are flapping their arms and burbling bubbles with pursed lips. Who wouldn’t like that? The program includes a wide variety of music from ‘Carol Singers Carol’ to ‘Sleigh Song’ to ‘Christmas Gloria’. Lori has instructed “Keep marching. It’s silly to stop” for Parade of the Wooden Soldiers. We all hope she is right when she tells us, “We’re going to get a groove on. We are really going to feel it!” Why not bring your own good spirits, come to the concerts and find out! Tickets available at the door for $10. Refreshments follow the concerts where you can mingle with friends and with the choir members.